Am I enjoying this holiday? I can’t really tell. I’m doing the dailies, but I guess that doesn’t really mean much. There’s a hat and a pet I don’t have, so I might as well grab them. I actually enjoy the torch dailies. Killing the elemental out in the world isn’t bad. It might be if it was in a less convenient location, but being right on the other side of the Dark Portal means I can port there and port back easily. What I don’t really enjoy is Ahune, the boss that requires queuing. It takes too long to wait around to find a group, and then it takes too long to do for something so easy anyways. It’s a basic fight, so it’s not particularly fun. It doesn’t drop anything good. I guess it’s a little fun to try to out DPS some DPS players while healing. I’d like to say I’ll be done soon, but I still need a decent chunk of the tokens. Oh well. Every Thursday I post a handful of links to articles written within the past week that are worth reading. True Love Between Gamers: I do take this rotting corpse as my husband, Lisa Poisso, WoW Insider, 6/21/12. Lisa recounts some stories of love blooming over World of Warcraft. Cross-realm play and the rise of the funsucker, Robin Torres, WoW Insider, 6/24/12. Robin considers the fact that there will now be no accountability out in the world while leveling once zones go cross-realm. Know Your Lore: What exactly is up with women in Warcraft lore?, Anne Stickney, WoW Insider, 6/24/12. Last week, Blessing of Kings discussed what message developers are sending by objectifying women in their games. This week, Anne at WoW Insider looks at women characters in Warcraft. Idea: Release Mists with No Raids?, Matticus, World of Matticus, 6/25/12. 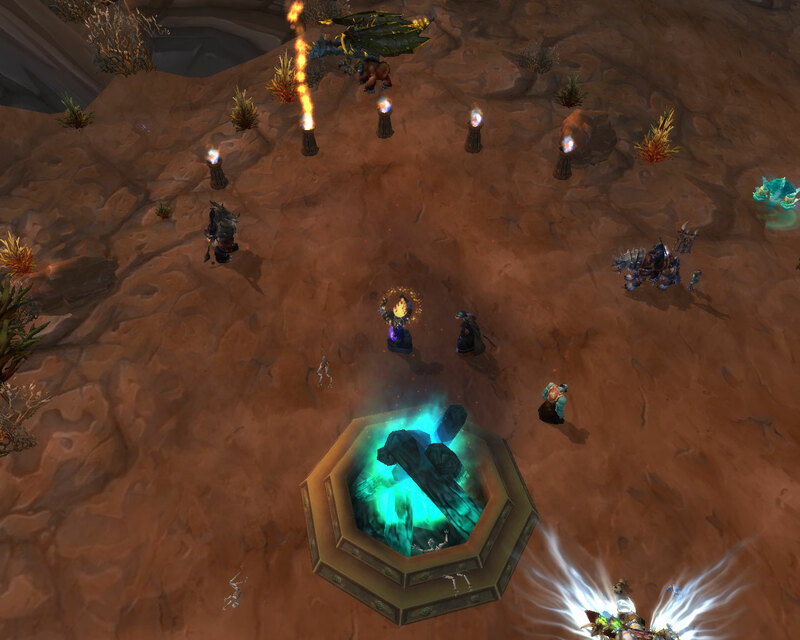 Matticus explores the idea of opening up raids after week 2 of Pandaria’s release. He believes this would level the playing field a bit between people who rush and people who don’t. It’s an interesting idea that I really like. On a personal note, two weeks would definitely not do it for me. WoW is one interest among many. Some days I spend my free time doing things other than playing video games, and when I do play video games, WoW is just one of them. WoW Moviewatch: Orc vs. Wild: Interactive Adventure, Michael Gray, WoW Insider, 6/14/12. Michael shares this great choose-your-own-adventure YouTube video. Mists of Pandaria: (╯°□°）╯︵ ┻━┻, Dawn Moore, WoW Insider, 6/21/12. (Dawn, you’re my favorite WoW Insider writer, but that title was annoying!) New to the beta is a flippable table! yes! Mists of Pandaria: Gold sink mounts will be account-wide, Robin Torres, WoW Insider, 6/25/12. Blizzard has gone back on their previous decision. Gold sink mounts will now be account-wide. 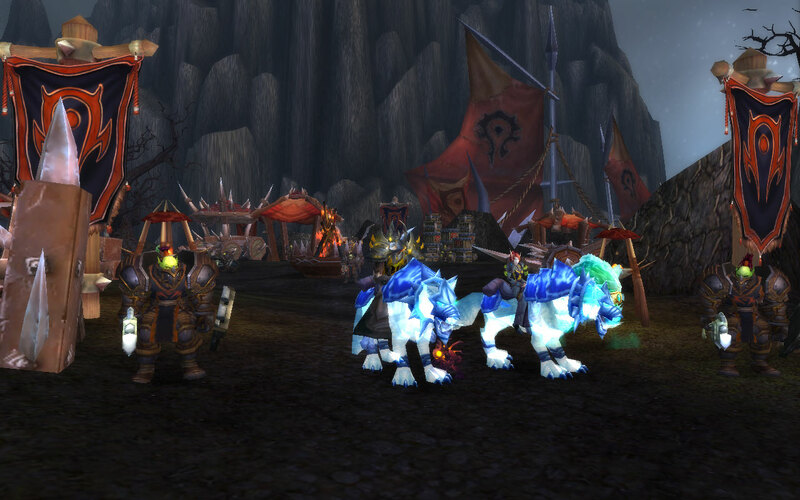 Recently, gem and I queued for the Frost Lord Ahune. As usual, it’s nice and easy. While we were looting, gem got a good look at Punishor, our tank. And while she said this, she ran in circles around him. This kind of behavior is normal when I play with her! Before I created Kor’kron 501st, I had a blog, WebPageless, at which I posted on any subject. I’ve found that I really enjoy having a dedicated site here for WoW and other online RPGs. The increased focus is much better. As such, I’ve created another site to cover gaming in general. I might spend a lot of time in WoW with brief journeys into TOR and D3, but I still play a ton of other games too. If you care to read my thoughts on other games or gaming in general, check out Polygons and Pixels. 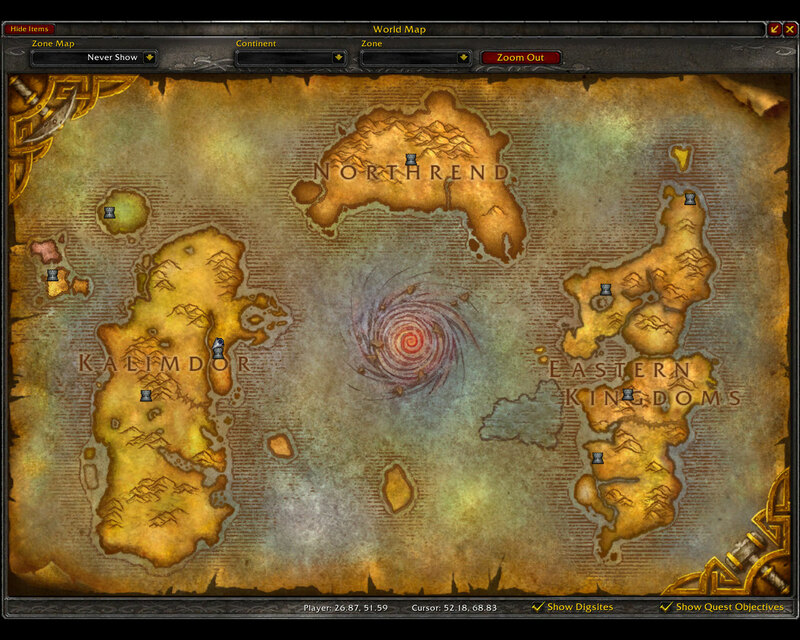 Every week, Blog Azeroth proposes a Shared Topic for World of Warcraft bloggers to discuss. Here’s this week’s topic, proposed by frinka. Knowing what you know now about the game, what name other than World of Warcraft would you give it? Why? To think of an alternative name, I started by paraphrasing the name World of Warcraft. What is the world of Warcraft? Azeroth. At first, I was thinking Azeroth would make a good alternative name. Then I started thinking about what role Azeroth plays. The series is about defeating the Burning Legion. It’s the Titans, the Light, the Naaru, Azeroth versus the Burning Legion. It’s about Azeroth being an anomaly among the planets in the Universe. Azeroth is different. Azeroth has withstood multiple invasions. Azeroth has struck back. The series is about The Rise of Azeroth. There have been other bloggers talking about their Cataclysm bucket lists lately, and I didn’t think I had anything I really needed to get done before Pandaria hits. However, I recently realized I was wrong. I’ve always thought of Wintergrasp and Tol Barad basically as battlegrounds. I do them for PVP. However, the fact that Wintergrasp is so dead shows that most people are likely doing them for the gear you can get. That means Tol Barad will likely die when Pandaria releases. Embarrassingly, I don’t have Tol Barad Veteran yet. I’m actually only 13/25. I need to step it up! To a lesser extent, I need to work on Loremaster. I don’t expect to finish it, but it’ll be easier now than later. When Blizzard’s new-fangled realm merging in under-populated zones, I suspect I’ll have people around me now in the low level zones. On the one hand, I like the idea the world feeling more alive. On the other hand, I don’t want to have compete for quest objectives. Most likely, I’ll finish TB off and forget to work on Loremaster at all. Reasons for the Backsliding in Portrayals of Women, Rohan, Blessing of Kings, 6/19/12. Rohan examines the idea catering to women, whether or not it’s what women actually want, usually brings about changes to make game easier and to include things like pet battles over PVP. As a consequence, Rohan thinks some companies objectify women or put them in provocative clothing to prove they’re not catering to women and therefore won’t make it easy and will continue to support things like PVP. Know Your Lore: King Varian Wrynn, or: How I learned to love the jerk, Anne Stickney, WoW Insider, 6/17/12. As someone who really only plays Horde, I found this article very interesting. It’s nice to see the humane side of Varian. Breakfast Topic: I met the critter guy, Dawn Moore, WoW Insider, 6/19/12. A very cute story about how Dawn met the Blizzard employee responsible for implementing critters. Then they both act adorable. Is Muradin your love match?, Bravetank, 6/18/12. Care to see what it would be like if Muradin used a dating service? I’m sure you do. 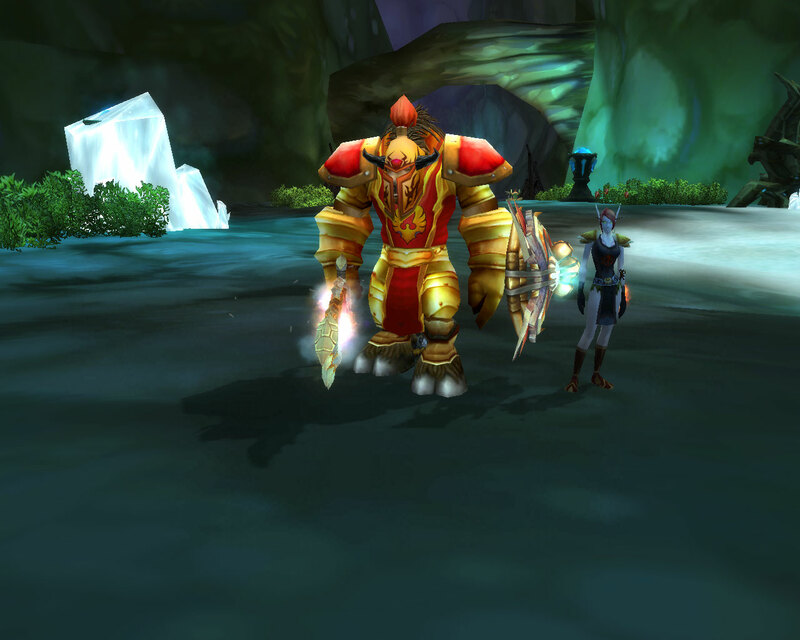 All-DK guild squeezes WoW in ice-fisted military death grip, Lisa Poisso, WoW Insider, 6/14/12. Alternative title: Super awesome RP guild is really sweet. Know Your Lore: Why World of Warcraft needs evil, Matthew Rossi, WoW Insider, 6/20/12. Rossi believes we need an evil that lasts longer than a patch or two. He also discusses how the Horde went from evil in RTS games to morally ambiguous in the MMO, forcing the Alliance to become ambiguous as well. PvP gear and the barrier to entry, Matthew Rossi, WoW Insider, 6/15/12. Rossi discusses ways to improve the PVP gear system, including having PVP legendaries. Somebody that I used to know, Pugnacious Priest, 6/15/12. The pugnacious priest comments on fleeting relationships in World of Warcraft.